All the deliciousness of pie, deconstructed in an ice cream parfait – super simple to prep ahead and assemble later. 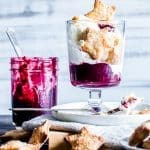 Blueberry-Rhubarb Pie Ice Cream Parfaits are fun for summer holidays and anytime ice cream is called for with vegan options included! With the long weekend ahead, I thought it was time to share a much-loved recipe. And, we all scream for ice cream, so why not create some ice cream parfaits? How about pie pastry crust cut into sweet little shapes with vanilla bean ice cream? Then add blueberry-rhubarb, lemon spiked pie filling/compote in and swirl it around. Blueberry-rhubarb pie without all the fuss. Ice cream parfaits are make ahead easy-peasy to pull-together too! Flexibility and ease is key here. Make an all butter crust, a dairy free all coconut oil pie crust or a gluten free crust and store it in the fridge for up to three days, or freeze for longer. Use store bought if needed! First, on a lightly floured work surface, roll out dough. Cut into decorative pieces using a cookie cutter if desired. Otherwise, leave the dough in one large piece. The large baked piece can simply be broken into shards prior to serving. Next, transfer the dough to the sheet pan. Mix the cane sugar and cinnamon together. Brush the pastry with milk, then generously sprinkle the pastry with a sugar/cinnamon mixture. Place the pastry into the freezer for 10 minutes. This is such a simple pleasure and so delicious to have on hand during rhubarb season. First, in a medium sauce pot, add the rhubarb and brown sugar. Stir. Cook on medium low for about 15 minutes, stirring occasionally. It will begin to thicken and look jammy. Next, add the blueberries, corn starch, lemon juice and zest. Cook on medium low for an additional 10 minutes, stirring and mashing the blueberries occasionally. Last, remove from heat and spoon into a heat proof container. Transfer the container to the refrigerator or freezer to chill. When you’re ready to share the ice cream parfaits, simply create an assembly station with bowls, spoons, ice cream and pastry and let everyone create their own parfait! Vegan or Vegetarian Ice Cream: Have you tried a cashew based homemade ice cream? My vegan bourbon vanilla bean ice cream is a perfect partner with this dessert! However, there are fabulous ice creams on the market that I like when I don’t have time to make homemade. A few of my favorites: Three Twins, Julies, Aldens (have you tried any of these?). For a vegan option, I like Nada Moo. Vegan or Vegetarian Pie Pastry: You’ll need enough pastry for one, 9 1/2″ (24cm) disk. Try my all butter-buttermilk pie dough, my vegan coconut oil pie dough or my gluten free crust. Any of these or a store bought crust works beautifully for this recipe. 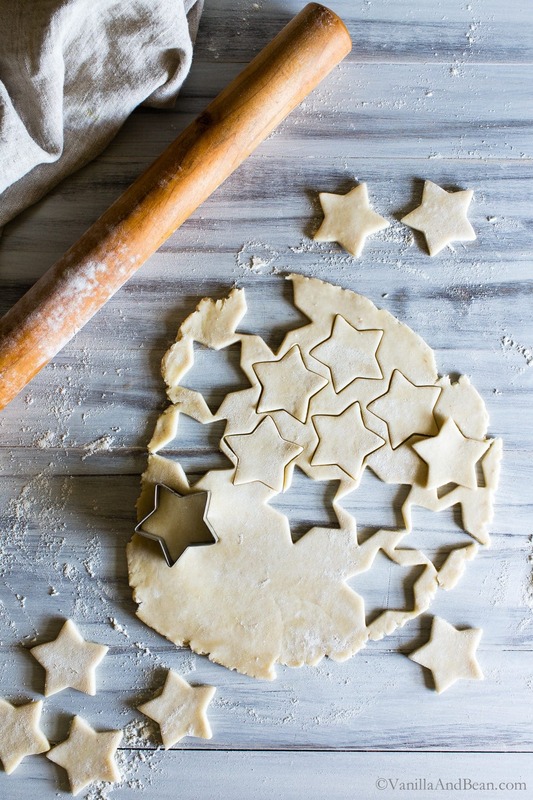 Use whatever small cookie cutter you have on hand. I use the small star from this set. Flower cutouts would be super cute too. Make Ahead: The pastry can be made up to a month ahead and frozen, or up to two days ahead and refrigerated. Once baked, the cutouts/pastry can be stored for at least two days in a covered container at room temperature. 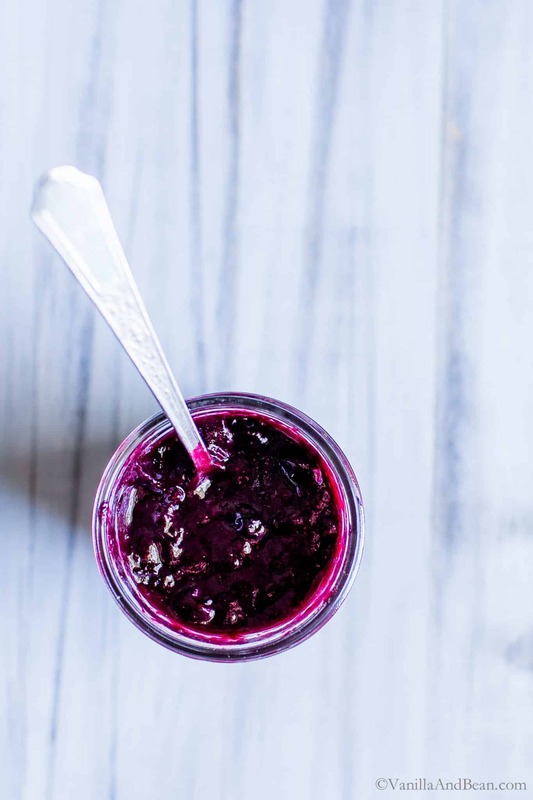 The rhubarb-blueberry compote can be made up to a week in advance and stored in a covered container in the refrigerator. Leftover rhubarb-blueberry compote is fabulous too slathered on waffles, pancakes or toast. All the deliciousness of pie, deconstructed in an ice cream parfait - super simple to make and assemble. 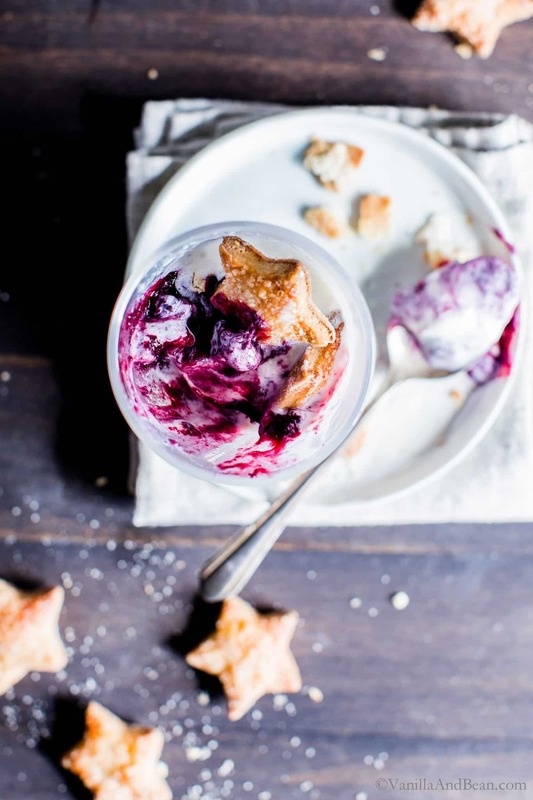 Blueberry-Rhubarb Pie Ice Cream Parfaits are fun for summer holidays and anytime ice cream is called for. Make the components ahead and assemble when ready to serve. 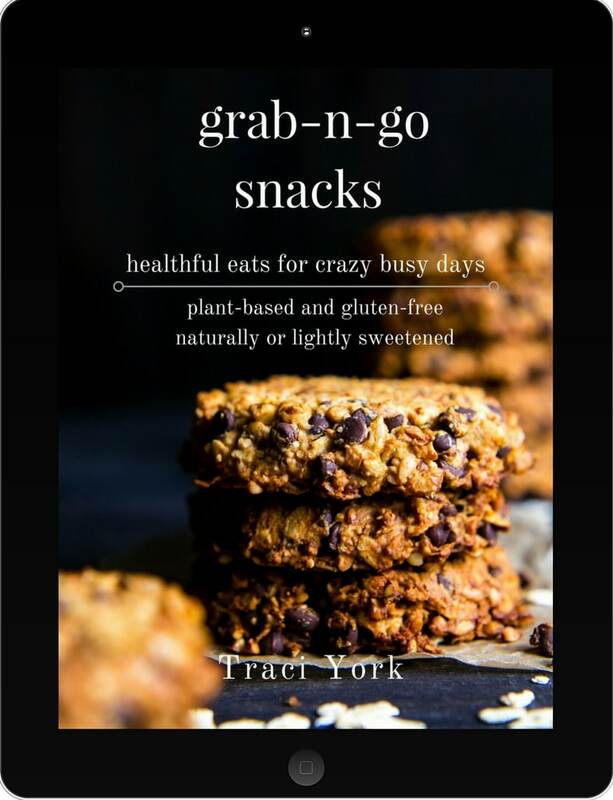 I've included vegetarian and vegan options linked in the notes above and below. *Time below does not reflect the time needed to make the pie crust, or cool the compote and crust. Preheat oven to 350F (180C). Set oven rack in the center. Line a sheet pan with parchment paper or silpat. Make the Pie Crust: On a lightly floured work surface, roll out dough to between 1/8" - 1/4" (3-6mm). Cut into decorative pieces using a cookie cutter if desired. Otherwise, bake the rolled out dough in one piece. The large baked piece can simply be broken into shards prior to serving. Transfer the dough to the sheet pan. Mix the cane sugar and cinnamon together. Brush the pastry with milk, then generously sprinkle the pastry with the sugar/cinnamon mixture. Place the pastry into the freezer for 10 minutes. Bake for 18-20 minutes or until golden. Note that the smaller pieces will bake faster than a large piece of dough. Keep the dough in the oven for an additional 2-3 minutes if baking a larger piece, or until golden. Make the Compote: In a medium sauce pot, add the rhubarb and brown sugar. Stir. Cook on medium low for about 15 minutes, stirring occasionally. It will begin to thicken and look jammy. Add the blueberries, corn starch, lemon juice and zest. Cook on medium low for an additional 10 minutes, stirring and mashing the blueberries occasionally. Remove from heat and spoon into a heat proof container. Transfer the container to the refrigerator or freezer to chill. 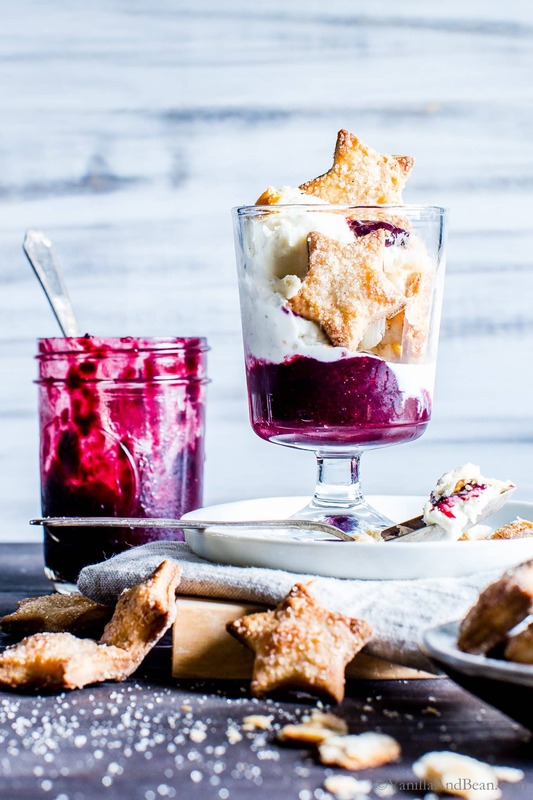 To assemble, layer compote, ice cream and shards of pie crust in a serving dish. Store pie crust in a covered container at room temperature for up to three days. The compote can be refrigerated for up to a week or frozen for longer. *For Pie Dough: I have three homemade options - my homemade coconut oil pie dough (vegan), all butter-buttermilk pie dough, gluten free - vegan or vegetarian will work. All of these variations can be made ahead and frozen or stored in the refrigerator for up to three days. **Have you tried a cashew based homemade ice cream? My vegan bourbon vanilla bean ice cream is a perfect partner with this dessert! However, there are some really great ice creams on the market that I like when I don't have time to make home made. A few of my favorites: Three Twins, Julies, Aldens. For a vegan option, I like Nada Moo. These are so cute! What a festive treat for the holidays! OMGEEEE!!! I am in love with these cutest Parfaits my friend! I love the little stars, such a cute touch! and perfect dessert for the patriotic holidays! OR otherwise :) I know my kids would go nuts over these! Oh my, these look wonderful. And those pastry stars are the cutest touch! Perfect for summer. Beautiful, Traci! Haha! Well, ain’t nothing wrong with that! I hope you enjoy it, Diego! Thank you for your note. These parfaits are seriously calling my name – so much deliciousness! I rarely eat rhubarb but this mash-up has me feeling all the need to get up in my rhubarbness. GORGEOUS photos but I bet it tastes even better than it looks, if that’s even possible. Fabulous Traci. These parfaits are so cute! 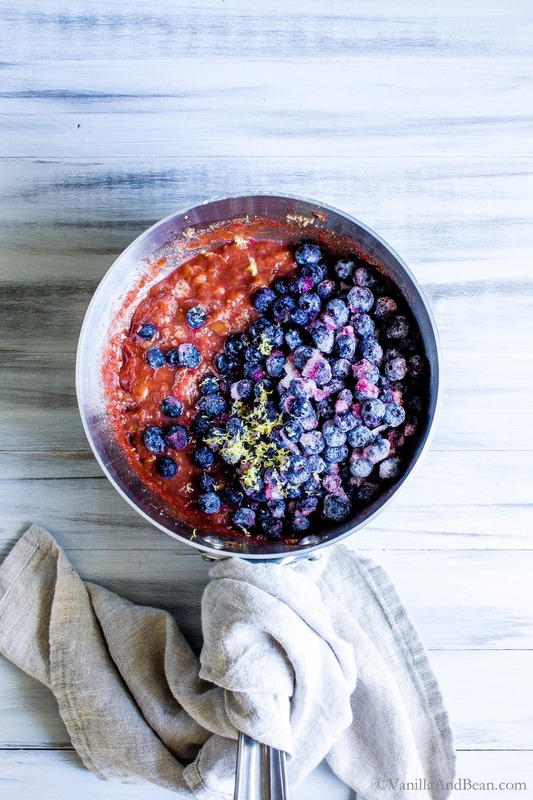 I love the idea of mixing blueberries and rhubarb! Thank you Sabrina! The combination is fabulous! Deconstructed pie- the best idea, Traci!! Looks so fun and festive and I am absolutely putting this on the top of my dessert list. I’ve never paired rhubarb with blueberries either so I’m exited to try that out too. Big fan of Aldens ice cream as well- so creamy and not overly sweet like some other brands. :) Hope your weekend was wonderful! Isn’t it fun?! Rhubarb and blueberries are such a nice surprise. I slathered the compote on toast this morning…. it’s quite versatile! Aldens and Julies… sooo good! Thaaank you Annie! The weekend was great… but it went way too fast! Very special way of presenting the whole idea ! Love it very much ! What a festive Memorial Day dessert! I love th blueberry rhubarb combination. I happen to have a quart of bourbon vanilla bean ice cream from my favorite local orchard that churns out the most delicious ice cream I’ve ever had. Cheers to the long weekend, Traci! Hey Jean! 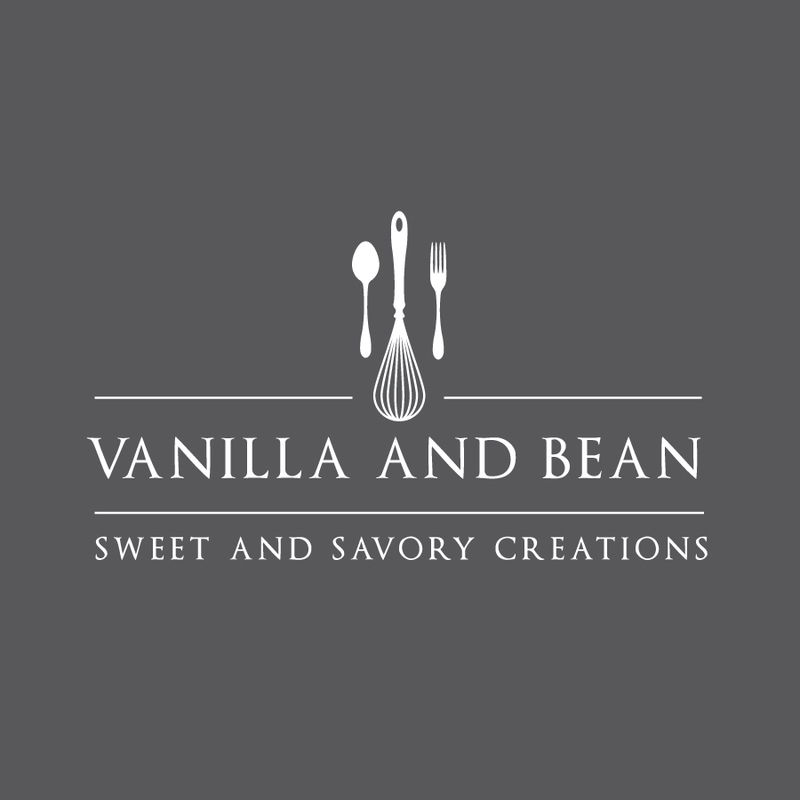 You’ve got bourbon vanilla bean ice cream in your freezer??!! :0 ! I’ve never ever seen it… anywhere it can be bought! So excited someone’s doing it! It’s sooo good! I hope you enjoy the recipe with that ice cream! So darling! I’m all about pie, but with less work. So this is right up my alley! Cheers to the Holiday weekend, Traci. I hope it’s relaxing! I’m in LOVE with everything about these Traci! The recipe, the photos…DREAMY! What a festive dessert for Memorial Day weekend! I always see the strawberry rhubarb combo, but you have pleasantly surprised me with a blueberry rhubarb combination! Love it! Happy Memorial Day weekend my friend! I knew you’d appreciate these Mary Ann! SO fun to make and festive too! 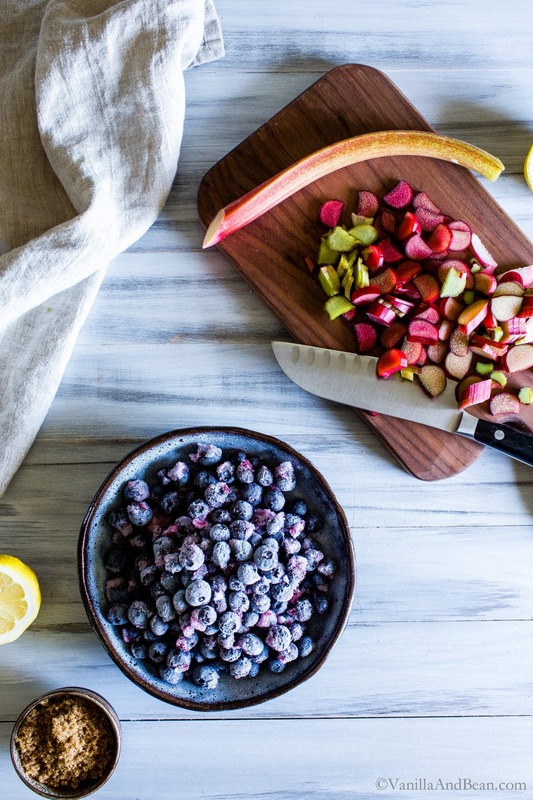 Go for that blueberry rhubarb! It’s lovely!